Overwatch vs. Battleborn: 7 Minute Side-by-Side Comparison of the Betas | Nerd Much? There are a lot of potentially great games to play right now. With Ratchet & Clank and Dark Souls 3 just releasing this week, and Steam Early Access being a thing (seriously, so many great games there right now), it’s safe to say people have their thumbs occupied. But we’ve already completed both of those great games, so we had plenty of time to jump into the Overwatch and Battleborn betas this week to get a feel for the upcoming arena shooters. Both of these titles are undeniably similar — a cartoony aesthetic, a plethora of characters to choose from, and numerous similarities in their gameplay. But just how similar are Gearbox’s Battleborn and Blizzard’s Overwatch? After extensive time with the betas, we’re leaning towards one of these upcoming games as a favorite, and we can see ourselves spending a lot more time with one more than the other. Of course, we’re not going to tell you which one we’re favoring just yet; we’ll let the video speak for itself. But to us, one of these games is much more enjoyable than the other. For more on Overwatch and Battleborn, stay tuned to Nerd Much. After they’ve released (next month), we’re going to do a much deeper comparison between the two games. 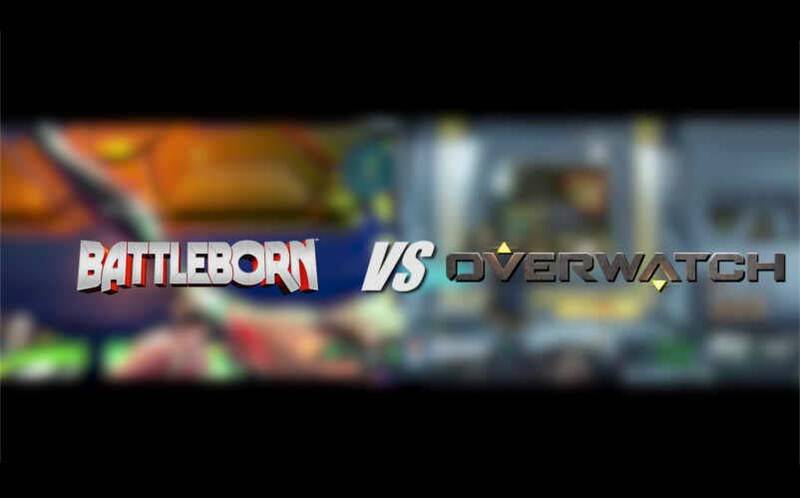 For now, check out the Battleborn vs. Overwatch comparison video above. You can pre-order both games on Amazon right now.